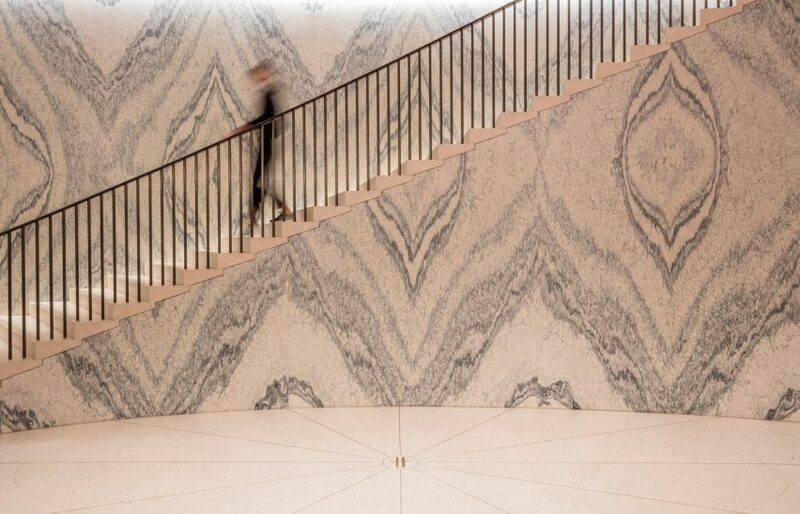 Rundell Associates has revamped the Harrods Fine Watches department by adding a marble staircase and a floor designed to look like a timepiece. The west London-based architecture practice has revamped the two floor showroom inside London's famous luxury department store. The marble staircase sits at the centre of the gallery-like display spaces. 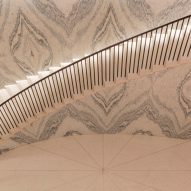 One side of the curved staircase is covered in book-matched panels of creamy Cipollino Tirrenia, a stone favoured for its strong veining. 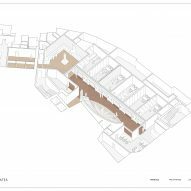 "The sweeping staircase is a significant new architectural feature that we hope will be enjoyed by customers for years to come," said Mike Rundell, designer and founder of Rundell Associates. Materials used in luxury watches have been used throughout the department's interiors. 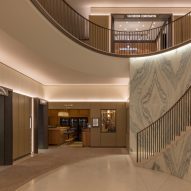 "The new Fine Watches department was conceived as a meticulously crafted environment that reflects the art and materiality of watchmaking, using the highest quality materials to create the sense of timeless elegance that Harrods is known for," added Rundell. 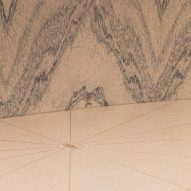 Terrazzo has been used for the floors and stairs, customised in a complimentary cream colour and flecked with fragments of mother of pearl, which is often used to decorate timepieces. Bronze inlay strips designed to mimic the details of a watch face spoke out from the centre of the floor, which is inset with a golden H for Harrods. 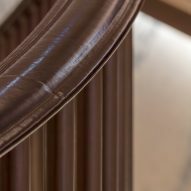 The handrails are made from patinated bronze and topped with plush leather shaped to look like the strap of an expensive watch. 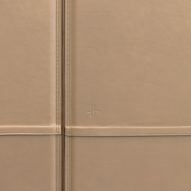 Pale leather has also been used to clad the walls of the department, tooled by master leather expert Bill Amberg. Above the stairs a vaulted ceiling dome is illuminated by lights programmed to sync with natural daylight levels, gently shifting throughout the day. 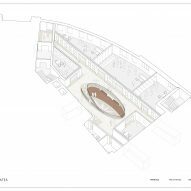 According to the architects, the oval shape of the light feature was designed to reference the shop's original grand light-wells. Designed by British architect Charles William Stephens, work on the Knightsbridge department store begun in 1894 and the store has always featured ornate interiors. Lights in the coving and along the floor edges provides a diffuse light throughout the gallery space and stairwell, and the individual display cases are lit to show their wares to their best advantage. The pale colour scheme, carefully celebrated lighting and soft walls were all choosing to create a "calming" atmosphere and a hushed acoustic. Rundell Associates also re-opened the historic entrance on Hans Road to create direct access to the fine watch department from the street. There are ten brand boutiques in the department, including Audemars Piguet, Rolex, Tudor and Tag Heuer, along with a multi-brand shop and VIP areas spread across the ground and lower ground floor. In Chengdu, China, Neri&Hu has designed a shop for an Italian accessories brand with an oculus based off of the Pantheon in Rome, and in Macau Foster + Partners has designed an Apple store with composite marble and glass walls that glow like a paper lantern.